Francis Fukuyama (2011), a political scientist, once described the challenge facing developing countries as the problem of “getting to Denmark”. This metaphorical Denmark would be a society characterised by wealth, the rule of law, good governance, and related virtues. But how did Denmark get to Denmark? For economic historians – see, for example, the account commissioned by the Food and Agricultural Organization of the United Nations (Skrubbeltrang 1953) – the answer involved a rapid modernisation of agriculture 150 years ago, when peasant producers adopted a new technology (the steam-powered automatic cream separator) and a new institution (the cooperative creamery). The outcome was that Danish farmers captured a share of the important UK export market for butter, and later bacon and eggs. Denmark rapidly converged on the leading economies, while traditional suppliers of agricultural goods such as Ireland and the Netherlands lost market share. Our recent research (Jensen et al. 2018) demonstrates that the roots of this success go back at least 100 years earlier than is usually assumed, and were grounded in the work of elites – large, often aristocratic landowners – rather than the Danish peasantry. This offers important lessons for today. Agricultural elites are not usually considered to be beneficial for development. For example, Engerman and Sokoloff (2002) stressed how higher land inequality creates agricultural elites, who then favour slavery and extractive institutions, leading to poor economic outcomes. Galor et al. (2009), Baten and Juif (2014), and Cinnirella and Hornung (2016) have demonstrated that high land inequality causes elites to block investment in human capital. Nevertheless, recent work in contexts other than agriculture has shown that elites can also be ‘knowledge elites’. Squicciarini and Voigtländer (2016) demonstrated that knowledge elites played a significant role in the industrialisation of France, for example by running businesses themselves or exchanging knowledge with entrepreneurs. Similarly, Hornung (2014) has shown that when Huguenots migrated to Prussia, their skills led to higher productivity in the textile sector. He interprets this effect as evidence of diffusion of technology. Previous research has usually viewed the peasant-owned cooperative creameries in Denmark as being in conflict with the traditional landed elites, who saw them as competition. Clearly the elites were unable to prevent them spreading rapidly. Figure 1 illustrates the location of the cooperative creameries in 1890, only eight years after the first one was founded. Source: Based on Bjørn (1988). This development, and the Danish success in capturing export markets, is usually explained in the context of the American ‘grain invasion’ from the 1870s (O’Rourke 1997). Cheap exports of US grain flooded Europe, promoting a protectionist backlash. Denmark, like the UK, chose to remain open, using the cheap grain as fodder for increased animal production. The conventional wisdom is that modern Denmark emerged within a few years based on a democratic, cooperative, and liberal countryside. This would become a catalyst for other agricultural countries around the world. Recent research demonstrates that immigrant Danes played an important role for modernising North American dairying. They brought the first automatic cream separators to the US, setting up cooperatives like those they had left behind (Boberg-Fazlic and Sharp 2018). But this does not explain how hundreds of butter factories could spring up in a few years in the 1880s, how dominance in agricultural exports could be so rapidly consolidated, and why this happened in Denmark and not elsewhere. 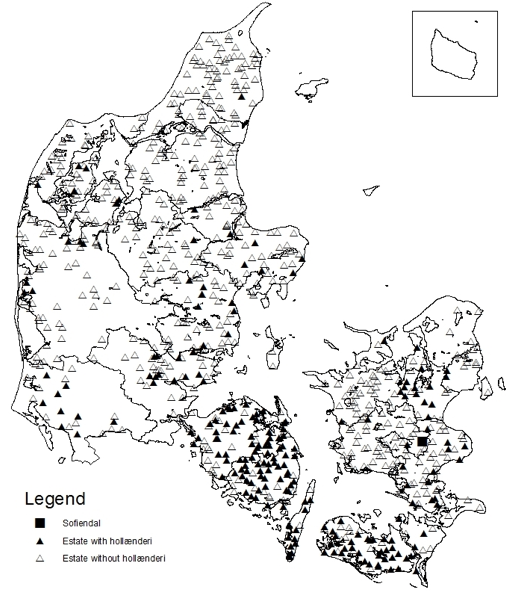 The small amount of existing research (Henriksen 1999, inspired by Ó Gráda 1977) largely focused on pre-existing cow densities, and the homogeneity of the Danish population that made cooperation possible. O’Rourke (2006, 2007) argued that the absence of conflict and the egalitarianism of the population distinguished Denmark from Ireland, where cooperation emerged later and less successfully. In a forthcoming book, two of us argue that the cream separators and cooperatives marked the end of the story of the modernisation of Danish dairying (Lampe and Sharp 2018). Unlike traditional accounts, we argue that the cream separator was the final piece of the jigsaw that allowed the cooperatives to form. In this interpretation, cooperatives were the unintended result of something which happened more than 100 years earlier, when elites moved into Denmark. The elites arrived in the 18th century following Denmark’s numerous military defeats by Sweden. The victors took some Danish territory. This caused financial difficulties for the Crown, which privatised most of the crown estates by 1740 to raise revenue. Many of these were bought up by elites from the duchies of Schleswig and Holstein, and ruled by the King of Denmark in personal union until 1864, when they were lost to Prussia. These newcomers saw opportunities for vastly improving the productivity of the Danish countryside. They brought a relatively sophisticated agricultural system they knew from home, known as the 'Holstein system', which introduced the idea of centralising dairy production. They also emphasised an early enlightened approach to agriculture, including modern standards of bookkeeping and accounting. Finally, they established knowledge institutions and experimented both on their estates and at specialist research institutions. For example, the first centrifuge in Denmark was trialled on one of these estates. In the book, we argue that it was a trickle down of ideas from the elites in the 1700s that later allowed the cooperatives to emerge so successfully. In our reduced form of the hypothesis (Jensen et al. 2018), we exploit the fact that not all parts of the country were equally influenced by the elites, which explains the specific spatial pattern of the cooperatives. 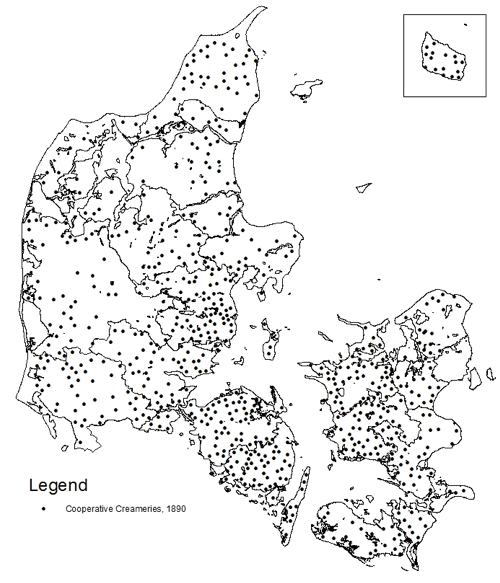 In Figure 1, we can detect a particular pattern for the location of the cooperative creameries: they are concentrated in an arc spreading down the east coast of the peninsula of Jutland, through the central island of Funen, and continuing north on the west coast of the eastern island of Zealand. Figure 2 shows that this is matched by the locations of the proto-modern central dairying facilities (hollænderier) established by landed estates in 1782. Empirically there is a causal relationship. This analysis uses the way in which the hollænderierspread around the country, by waves of imitation emanating from the first, founded on an estate called Sofiendal (also marked in Figure 2). This occurred in the 1760s, driven by Adam Gottlob Moltke, who was effectively prime minister from 1746 to 1766, and had brought his estate administrator from Holstein. Source: Jensen et al. (2018), based on Bjørn (1988). This has important policy implications. Denmark is often the embodiment of the idea that countries can develop through cooperation in the countryside. It undermines the assumption that a country with a lot of peasants and cows (Ireland at the turn of the 20th century, for example, or India after WWII) can simply cooperate its way out of underdevelopment. Denmark got to Denmark not simply by having hard-working peasants and a democratic countryside, but on the shoulders of landed elites. Moreover, this process took more than 100 years to complete. Baten, J and D Juif (2014), "A story of large landowners and math skills: Inequality and human capital formation in long-run development, 1820–2000", Journal of Comparative Economics 42: 375-401. Boberg-Fazlic, N and P Sharp (2018), "Immigration and Knowledge Spillovers: Danish-Americans and the Development of the Dairy Industry in the United States", in preparation. Cinnirella, F and E Hornung (2016), "Landownership concentration and the expansion of education", Journal of Development Economics 121: 135–152. Engerman, S L and K L Sokoloff (2002), "Factor Endowments, Inequality, and Paths of Development Among New World Economics", Economia 3(1): 41-88. Fukuyama, F (2011), The Origins of Political Order: From Prehuman Times to the French Revolution, Profile Books. Galor, O, O Moav and D Vollrath (2009), "Inequality in Land Ownership, the Emergence of Human Capital Promoting Institutions, and Great Divergence", Review of Economic Studies 76(1): 143-179. Henriksen, I (1999), "Avoiding lock-in: Cooperative creameries in Denmark, 1882–1903", European Review of Economic History 3(1): 57-78. Hornung, E (2014), "Immigration and the Diffusion of Technology: The Huguenot Diaspora in Prussia", American Economic Review 104(1): 84-122. Jensen, P S, M Lampe, P Sharp and C Skovsgaard (2018), "Getting to Denmark: The role of elites for development," CEPR Discussion Paper 12679. Lampe, M and P Sharp (2018), The Creation of a "Land of Milk and Butter": How Elites Created the Modern Danish Dairy Industry, University of Chicago Press. Ó Grada, C (1977), "The Beginnings of the Irish Creamery System, 1880-1914", Economic History Review 30: 284-305. O'Rourke, K H (1997), "European Grain Invasion, 1870-1913," Journal of Economic History 57(4): 775-801. O'Rourke, K H (2006), "Late Nineteenth-Century Denmark in an Irish Mirror: Land Tenure, Homogeneity and the Roots of Danish Success," In National Identity and the Varieties of Capitalism: The Danish Experience, edited by John L Campbell, John A Hall and Ove K Pedersen, McGill-Queen’s University Press. O'Rourke, K H (2007), "Culture, Conflict and Cooperation: Irish Dairying Before the Great War", Economic Journal117: 1357-79. Skrubbeltrang, F (1953), "Agricultural Development and Rural Reform in Denmark", FAO Agricultural Studies22. Squicciarini, M and N Voigtländer (2016), "Knowledge Elites and Modernization: Evidence from Revolutionary France", Quarterly Journal of Economics, forthcoming.